Just a little butter, parsley, and salt is all you need to make irresistible potatoes on the grill. Preheat your Kenyon Grill to high for 7 minutes. Cut potatoes in half for uniform pieces. 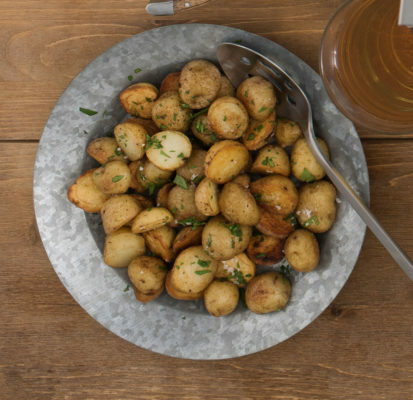 In a small bowl, mix butter, parsley, and salt; pour over potatoes. Once grill is heated, turn the temperature down to 5 bars (medium heat) and place potatoes on the grate. Cook for 15 minutes on each side or until the potatoes are tender.